Treasury Secretary Timothy Geithner, an architect of the bailouts given to big banks in the wake of the 2008 financial crisis, has reportedly expressed opposition to the appointment of Elizabeth Warren to head the new Consumer Financial Protection Bureau. 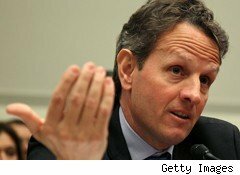 Should Geithner have his way, Warren, the most prominent advocate for creating the agency, may not be picked to lead it, according to a report by HuffingtonPost.com, which cites an anonymous source with knowledge of Geithner's views. The new agency, the creation of which is mandated in the financial reform bill that passed the Senate on Thursday, is charged with protecting consumers from predatory lenders. Warren, a Harvard Law School professor, has since 2008 headed the Congressional Oversight Panel, a bailout watchdog created to monitor how the hundreds of billions of taxpayer dollars set aside for Wall Street bailouts has been spent. Warren's role has led to strained relations with Treasury, which her panel has taken to task with critical reports each month that President Barack Obama has been in office, HuffingtonPost said. Warren's persistent oversight is part of the reason for Geithner's opposition. He also objects to Warren's views about Wall Street. The longtime professor believes the nation's mega-banks are too big to fail and have been among the biggest abusive lenders in the country, the report said.